So it's officially the end of reading week and everyone is returning back to the city to get one last turn up in before finals. Conveniently enough, its also Halloween weekend and the city is about to be on one! There's a long line up of different Halloween events happening all over Downtown Ottawa. From Afro beats to House we got you! 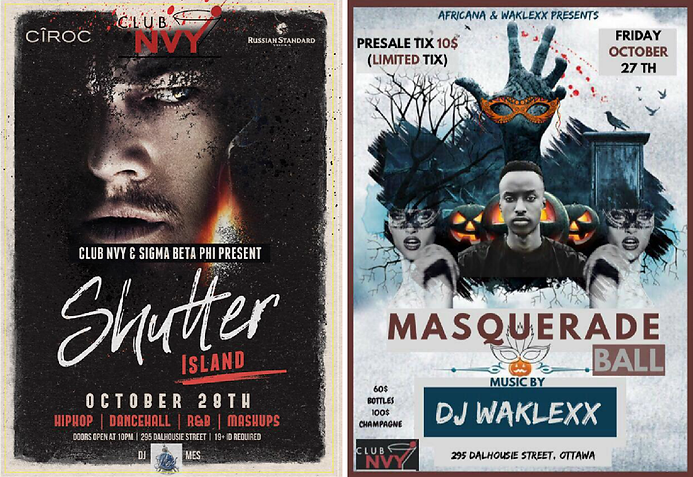 There's definitely a lot happening this weekend and depending on the type of crowd or music you like, there are so many different clubs in downtown Ottawa that will cater to you and your club needs! Have a safe Halloween weekend from the Ci3 fam! Drink responsibly and where ever you end up , tell em City in Three sent you! Club NVY is holding it down this weekend! They got 2 popping events happening; A masquerade ball brought to you by Africana and a Shutter Island themed Halloween bash hosted by local sorority Sigma Beta Phi! If your looking for a place with an urban vibe, the hottest tracks out right now and 60$ bottles, here is where you NEED to be! We all know PPL. nightclub always got it going on! Thursday, they have an ABC (anything but clothes, girl!) pre-Halloween Party with $3 shots; it doesn't get wilder than that! Friday, they have Afro Halloween Hosted by Ottawa's very own CASHBOYS613 so come through and listen to some of the baddest music (ok not actually bad, guys) from overseas! This Saturday at Kavali, expect the hottest Reggaeton and R&B. Be prepared to drink and dance all night at one of the liveliest clubs in Ottawa for Fiesta Del Payaso which translates from Spanish to Party of the Clown... Creepy! Babylon has a sick line up for you because, of course, they'll be ending the weekend with a Halloween themed Drake Night! You may second guess your choice once you take a look at the infamous lineup to get in to Drake Night, but the vibe inside is so worth the wait! On Halloween night itself, they have zombie strippers; yea, you read that right, zombie strippers! Don't ask me any questions, you'll just have to go find out. We got another long line up for you at Junxion! Any Ottawa local knows about Tequila Tuesdays and how poppin' they are but let's take Tequila Tuesdays to the next level this Halloween and come dressed as a superhero! They've also got some dope events planned for the Friday and Saturday including a Monster Bash. They always get bottles poppin' at Flybar. If you enjoy Afrobeats, Hip-Hop, Rap and some Reggae, here is where you need the this weekend! People are always dancing and the atmospheres like no other! My favorite part is the 3 Brothers next door! Nothing beats a chicken poutine after a long night of drinking and dancing. Tequila Jacks' Halloween Line up starts tonight and goes straight until Tuesday! Tequila Jacks ain't playing y'all!! Check them out this weekend, they have prizes for best dressed, giveaways and much more. It goes without saying, the girls at Green Room know how to get down. For some Halloween fun that involves dancing on bars and tables this is the spot! They have Top 40, Mashups and Hip-hop, be sure to check em out this weekend! Bourbon Room has a lot happening this weekend but I wanted to draw focus on their Vampire Ball happening this upcoming Tuesday. Come dressed to impress! Put on your best or scariest costumes to have a shot at winning a cash prize for best costume!